A few years ago, I started hosting “Parties at the Parsonage with the Pastor,” or PPP’s, as they have come to be known. The PPP’s were informal gatherings for members of my church the week before Christmas. Everyone was invited to drop by for a bowl of chili and light conversation! We stopped hosting the PPP’s the year our first child was born. He was only a few weeks old and our doctor advised us to minimize his exposure to germs. Plus, we were hypersensitive first-time parents!! The PPP’s found new life last summer, when the older youth of our church claimed our house as their hang-out spot. My wife and I have lead our church’s youth group for several years. Last summer, a group of students started visiting us at home. My wife and I were happy to open our house to them, because we knew many of these students were looking for an alternative to the social opportunities observed by their peers. The PPP’s have continued through the year and into this summer. A few of our students came over last night for a PPP. Many of the students were busy, so only a couple showed up. Our conversation included the regular sharing of recent news and light banter for the majority of our time. Towards the end of the night, our conversation drifted into current events – specifically, the 2016 election. These students will be able to participate in their first Presidential election this year. These four young people are apt. They quickly catch on to concepts and retain information. Two of the students, in particular, took very seriously their right to participate in the democratic process. They began to communicate their understanding of the current Presidential race, their concerns, and their hopes for a better (not greater) America. Listening to these young people speak about the current political landscape was extremely entertaining (and encouraging). The competence of these students was intimidating. They spoke intelligently about Reagnaomics, the misfortune of Hoover’s administration, and the subtle reference to FDR in House of Cards. They addressed the presidencies of Coolidge, Hays, and others. The conversation was civil, intelligent, and informed (though, a little idealistic). No endorsements were made; the entirety of the conversation spoke to their awareness of the issues and how past presidencies and foreign governments have shaped their perspective. The aptitude of these young people was impressive and a little intimidating. I was equally intrigued by an underlying theme in their conversation. An unspoken concern for the current state of our world, our country, and the need for strong, reliable, and trusted leaders ran beneath their words! Reflecting upon their conversation and everything else going on in the world around us, I was reminded of a challenge Paul presented to the Philippians. Paul wrote the church in Philippi while he is imprisoned. His situation clearly influenced his thoughts and his words for the Philippians. Paul encouraged his audience to be imitators of Christ (2:1-11). He, then, became very specific about how each individual believer should approach their life and their day to day routine. He encouraged these individuals to “work out their salvation with fear and trembling” realizing God was at work within them. (2:12-13). “Shine like stars in the world” is the challenge Paul presents to the Philippians. I absolutely love these words! I love the imagery; and, I love the power they convey: the smallest light will always overcome the greatest darkness. But, there is another reason why I believe these are beautiful words. Side Note: I do not believe a pulpit should be used for the promotion of a political agenda. I believe the pulpit is a sacred space reserved for the proclamation of God’s word for the service of God’s will. Whether I am standing in a pulpit or sitting in the recliner in my parsonage, my pastoral responsibility is not to promote my views. My responsibility is to serve the will of God by prayerfully seeking to communicate the word of God. Effective and responsible communication of the God’s word requires hearing your audience, knowing your audience, and caring for their spiritual health. 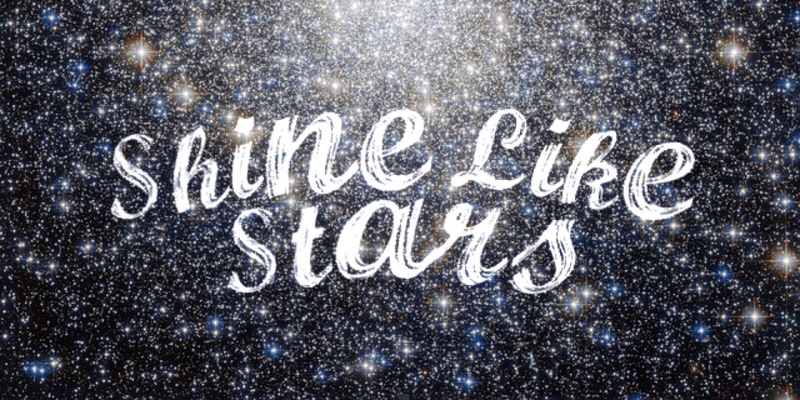 Why are the words “Shine like stars in the world” beautiful? These words are beautiful because they place responsibility into the hands of the individual! These word stress the responsibility of the individual to respond to the work of God within them. And, honestly, these words speak well beyond responsibility to the acknowledgment of blessings. All are blessed to have God present and active in our life; and, therefore, we are blessed to bear witness to God, which is nothing more than an expression of divine love. The current election has attracted a lot of attention. There are strong views on all sides. I’m not going to share mine here; rather, I am going to point us back to those incredible words of Paul. The responsibility falls to us. We are called to recognize the presence of God in our life, working in us, and working though us. No matter what our circumstance may be, we still have the ability to shine like stars. Our life can serve as the witness to the grace, mercy, and power of God! In and through us, the power of God’s love will pour into the world – this glimpse of God will always overcome the greatest darkness…when we shine like stars. You see, I am all for having beliefs and opinions (religious, political, or otherwise), but placing blame on others does not seem to be very productive. Assuming responsibility for one’s self and responding to the word of God in one’s life seems like a more efficient way to influence our world. That is why I like Paul’s challenge to shine like stars. Be different from the rest, by letting God’s work within you shine beyond you. To my students and every young person everywhere, thank you for being aware. Thank you for having an opinion. Thank you for appreciating your right to participate in the democratize process. Go, find your place in the world! This entry was posted in Writing and tagged #Christianity, #Faith, #God, #inspiration, #politics, #united methodist church, 2016 election, stars by SkippingStones. Bookmark the permalink.